British beauty blogger Amena Khan announced she is stepping down from L’Oreal campaign over tweets she wrote in 2014, when she was criticizing Israel during its war on Gaza. On her Instagram account, Amena Khan confirmed she deleted her old tweets, saying she “regret the content of her tweets I made in 2014, and sincerely apologise for the upset and hurt that they have caused”. She confirmed she chose to delete them as they “don’t represent the message of harmony” she is standing for during her campaign. Amena wrote that her decision to step down came after “the current conversations to detract from the inclusive sentiment [the campaign] is set out to deliver”. This comes following the discovery of old tweets were posted by her in 2014, criticizing Israel during the war on Gaza in 2014, describing them as children murders. “You repeatedly say “nobody is above the law”. Well, under international law, Israel is an illegal state. Yet you support them. EXPLAIN #AskDavid,” Amina wrote in one of her tweets. 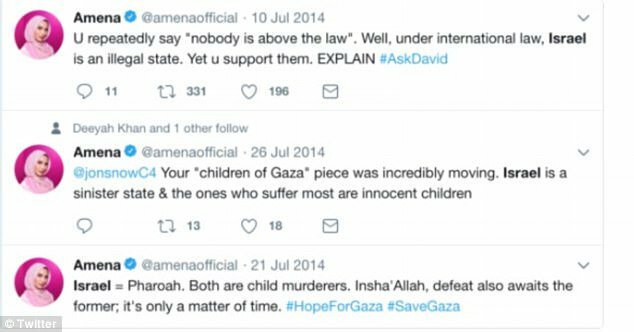 Image from Twitter showing Amena's old tweets while she is attacking Israel. Amena was accused of expressing ‘anti-Israel’ sentiment. As activists were divided among supporters and critics, British journalist Sunny Hundal tweeted: "A British Muslim woman has been hounded out from an ad campaign for being critical of Israel. So criticising countries is racist now? "Where are those defenders of free speech now?" Another British online magazine, Media Diversified, tweeted: "Amena has stepped down from the L'Oreal campaign after her old tweets criticizing Israel were unearthed”. "Another situation where women of colour are good enough to front a campaign...until they have an opinion,” they wrote. "Then all hell breaks loose." On the other hand, a spokesperson for L'Oreal Paris confirmed to Newsbeat: "We have recently been made aware of a series of tweets posted in 2014 by Amena Khan, who was featured in a UK advertising campaign”. Few days earlier, the blogger, model and co-founder of Ardere Cosmetics, Amena announced she was delighted to be the first woman in a hijab to be part of a mainstream advert for hair care, the BBC wrote. She had hoped her role would inspire and empower other women who wear headscarves. “They’re literally putting a girl in a headscarf ― whose hair you can’t see ― in a hair campaign. Because what they’re really valuing through the campaign is the voices that we have,” Amena said.